SEARL & ASSOCIATES established a grid system that flowed through the major rooms starting with the Entry Hall and ending in the Study. The grid layout aligned the maple wall panels, brass inlayed flooring and paneled ceiling. This demanding design required an experienced and detail-oriented Project Manager to size and order the panels and our talented craftsmen to install the prefinished panels and reveals in a building that was significantly out of level and plumb. In addition, T.h. Snyder worked with the architect and contractor to engineer the details to encompass concealed doors and semi-concealed sliding doors in the paneling. Further initial coordination was taken to ensure the solid maple framed panels followed in order per the sequence matched Plain Sliced White Maple veneer with a Slip Match pattern. The end result created a crisp, clean, contemporary living environment. Working with MARVIN HERMAN & ASSOCIATES and WUJCIK CONSTRUCTION, T.h. 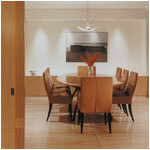 Snyder Company provided woodwork for this Michigan Avenue apartment. Of particular note are the Library and the Master Bath/Dressing areas. T.h. Snyder Company sourced the Italian Walnut in the Library for its light color and unique crossfire figure. The shop painted Master Bath includes a radius tub surround in a serene paneled space. 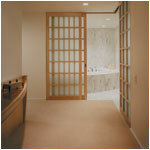 Leading into the Master Bath is the Master Dressing hallway created by floor to ceiling casework. Pivot doors on each side lead to two dressing areas. Throughout the apartment, precise stile and rail dimension on panels and 1/16" reveals on the cabinetry add to the elegance of this gracious yet exacting design.